Buckpool is a characterful place on the west side of Buckie on the Moray coast. This is a view along the shoreline looking west from the silted-up old harbour, which is directly behind us here. The harbour was built in the mid-19th Century but was abandoned as it tended to silt up too quickly. It was filled in and turned into a park last century. 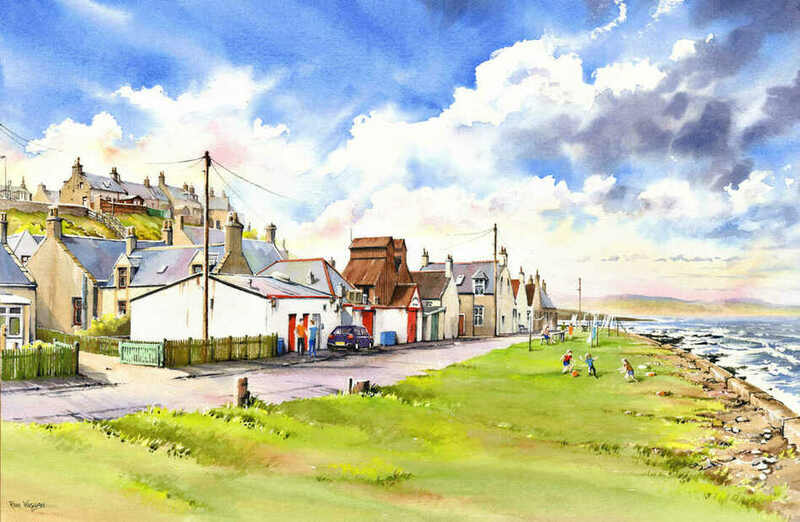 The business here is a seafood business, of which there are many along Buckie's sea front and the view along the coast is open for many miles. Children play football on the grass, whilst behind them the area of the washing lines doubles as a casual seating and meeting area for the residents! The original painting was sold by commission.